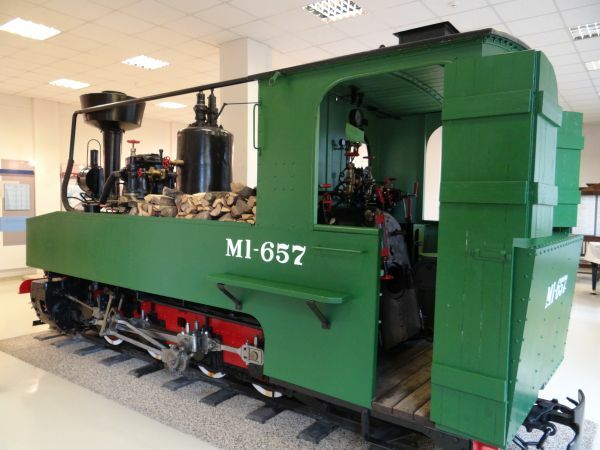 This small narrow gauge steam locomotive is among the plenty of army material that the retreating German Wehrmacht (army) had to leave behind when fleeing the red army towards the end of second world war. It is an 0-8-0T tank engine previously listed as "HF2305". Picture at railway museum in Riga 14.6.2013 by Ilkka Siissalo. 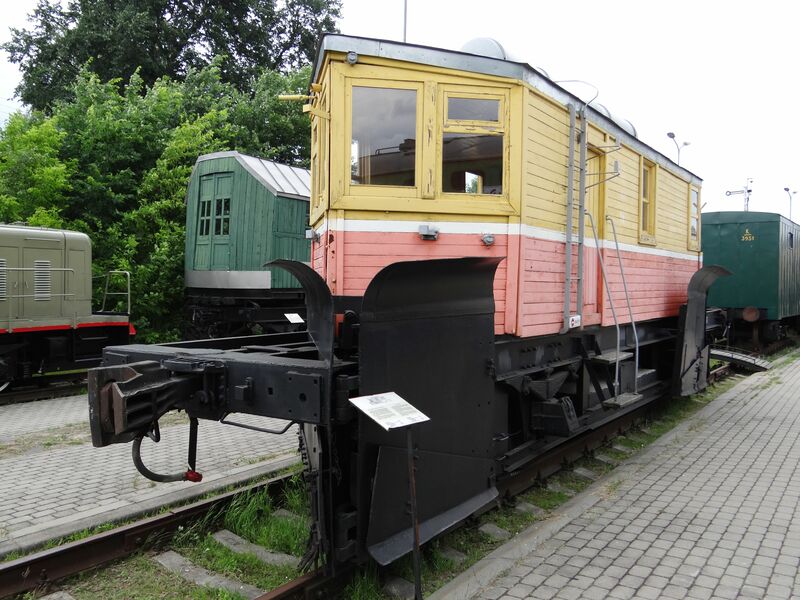 Another view of the same German Heeresfeldbahn army locomotive MI-657. 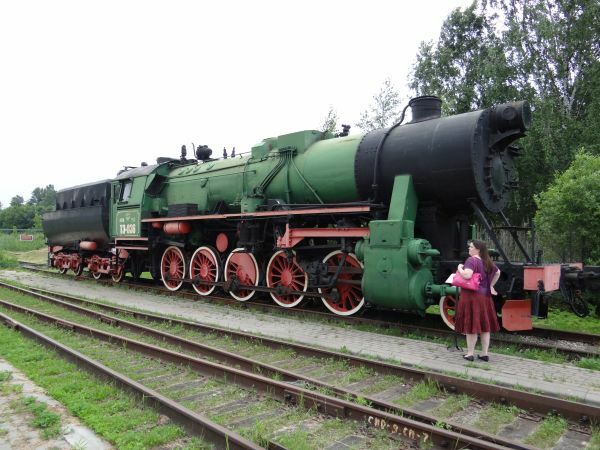 Picture at railway museum in Riga 14.6.2013 by Ilkka Siissalo. 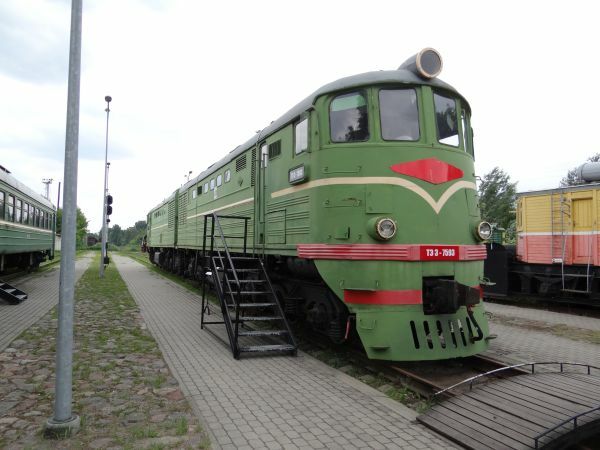 Front of a class TEP-60 passenger train diesel locomotive. Train photographer Sanna Siissalo is standing by the locomotive just to show the dimensions. Sanna is about 1,7 m tall with those shoes. Many old Russian trains are extremely high. These TEP-60 locomotives were in use even as late as 2000-2003 in express trains for example between Riga and Moscow or Riga and Minsk. Here the locomotive front is painted as it was in Soviet socialist times. 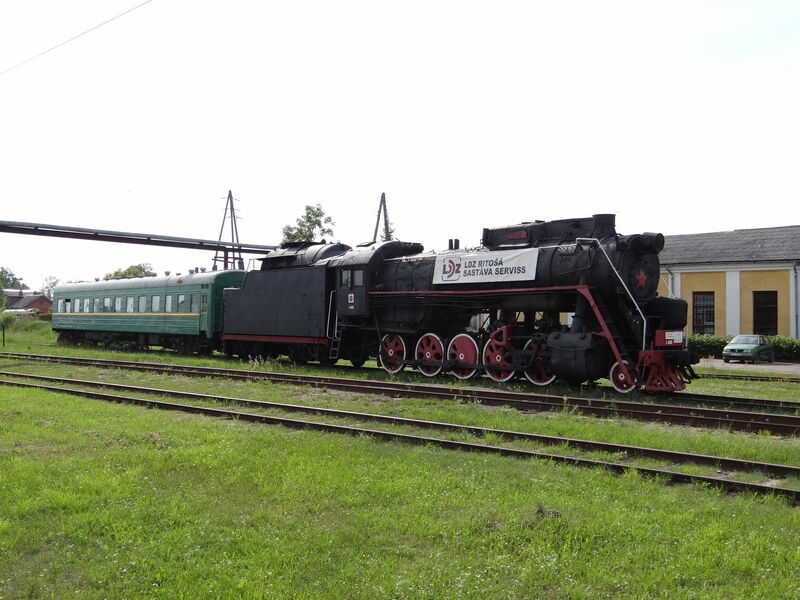 Picture at railway museum in Riga 14.6.2013 by Ilkka Siissalo. 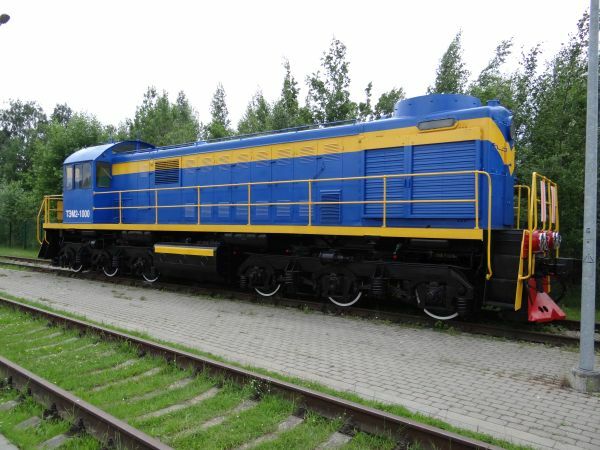 A class TEP-60 express passenger train diesel engine - the whole machine. They were built 1960-1985 by the Kolomna electric works in the old USSR in Kolomna, in Moscow oblast, and they are still in use in some ex-USSR countries, for example in Belarus (Belorussia) where they have 16 of them. It is a six axle diesel with a top speed of 160 km/h and a power rating of 2237 kW. 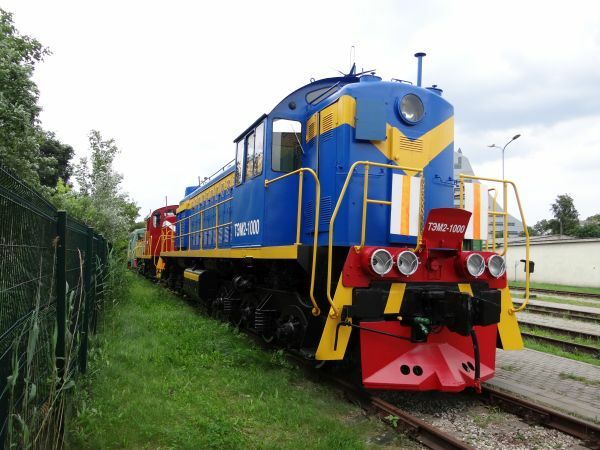 If you click on the Estonia pages and from there the Eesti Raudtee (Estonian state railways), you can see another similar machine in Estonian colours. Lithuanian state railways also used them and even repainted some of them in their very newest red and white colours. 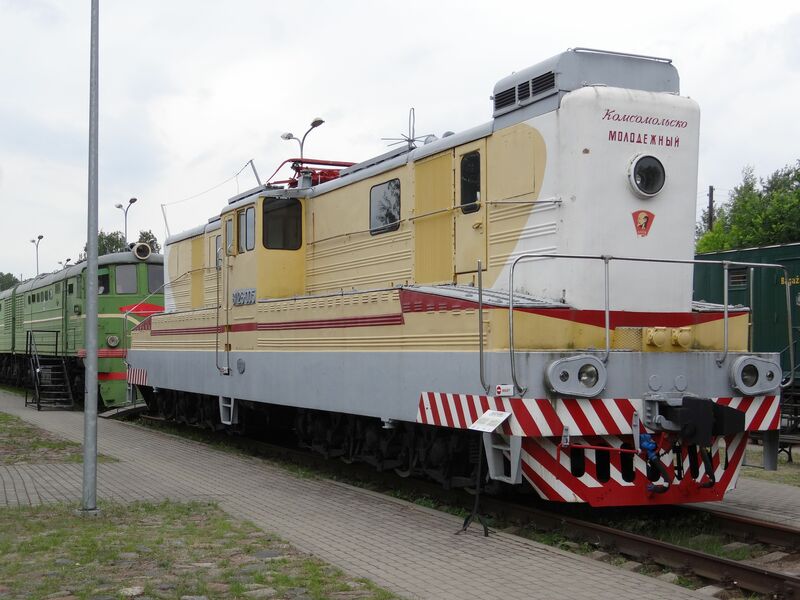 There is one also at the railway museum in Vilnius, Lithuania. In the background a Soviet Russian class L steam engine. Picture at railway museum in Riga 14.6.2013 by Ilkka Siissalo. A closeup of the same TEP-60. Picture at railway museum in Riga 14.6.2013 by Ilkka Siissalo. 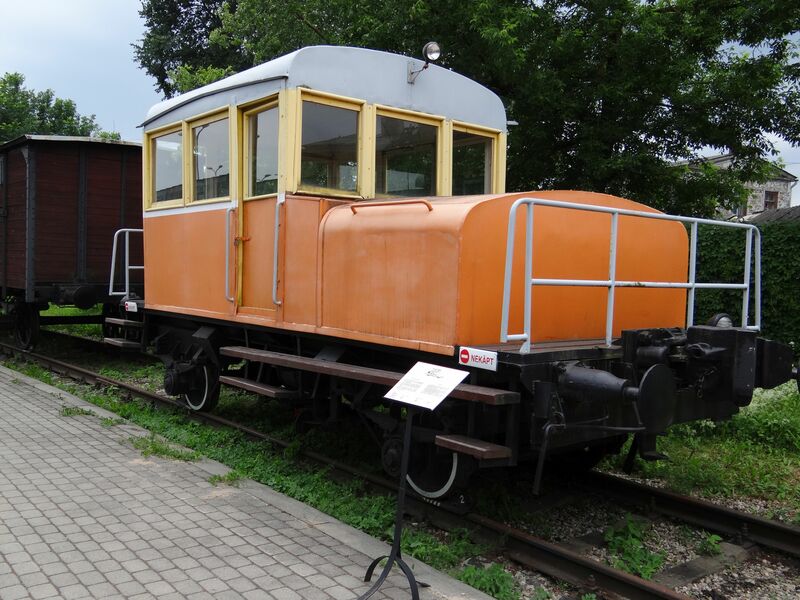 A 600 mm narrow gauge passenger coach as it was used right after second world war at several Latvian narrow gauge lines. 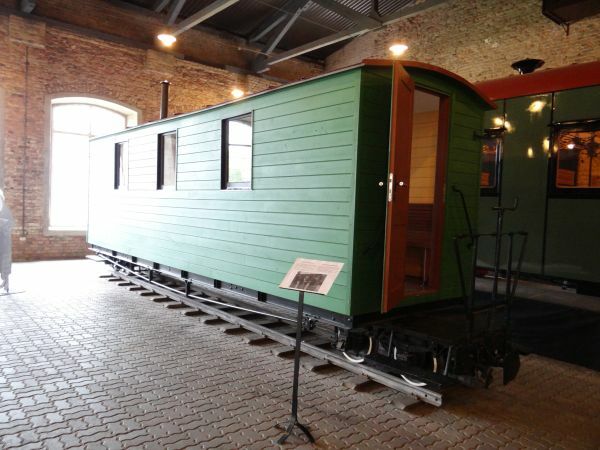 The undercarriage has been built during first world war in Germany for the use of the German army as a Heeresfeldbahn coach, but the wooden structure above is newer. This coach was last used at the Ligatne paper mill, from where it was donated to the museum in 1998. 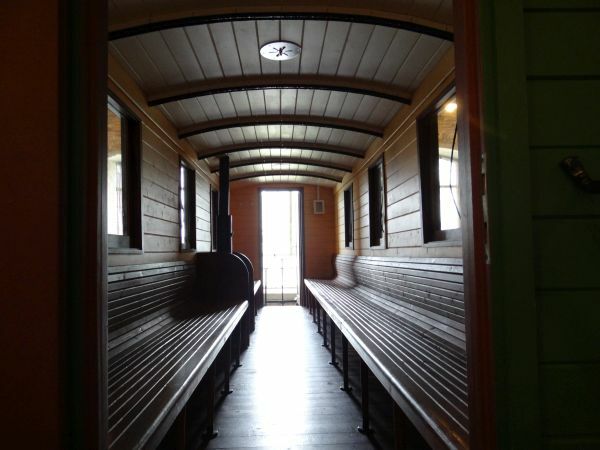 There were 26 passenger seats in the carriage. Picture at railway museum in Riga 14.6.2013 by Ilkka Siissalo. Inside view of the same narrow gauge passenger carriage as above. Picture at railway museum in Riga 14.6.2013 by Ilkka Siissalo. 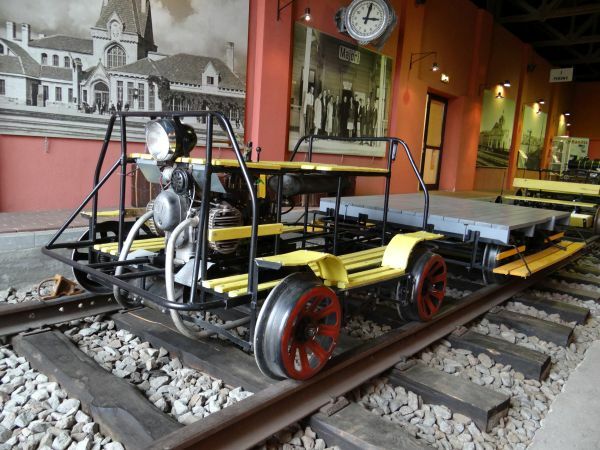 A small old motor draisine used for track inspection purposes. 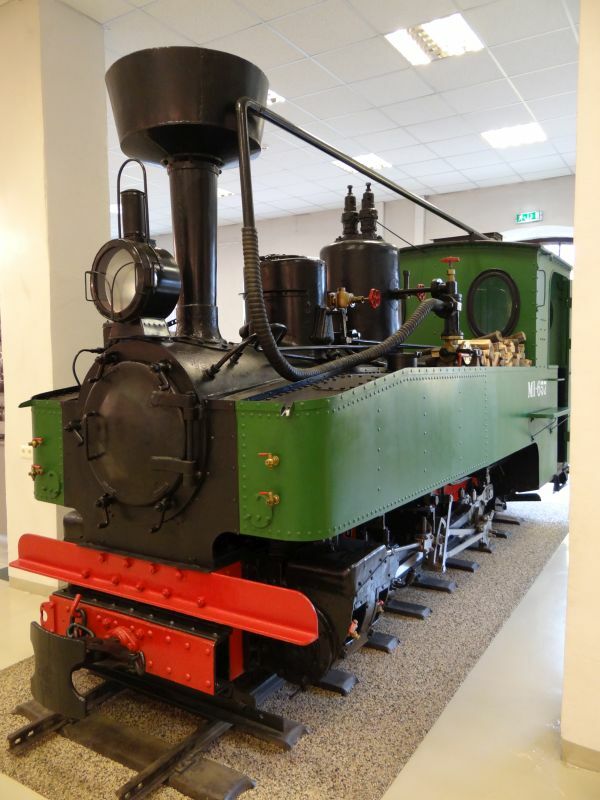 Picture at railway museum in Riga 14.6.2013 by Ilkka Siissalo. 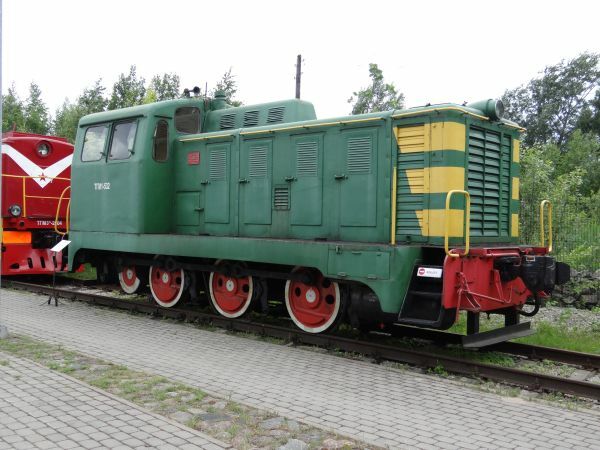 Class VL-26 electric cargo locomotive. These six axle monsters were used for example at the famous Murmansk railroad St Petersburg (Leningrad) - Petrozavodsk (Petroskoi) - Murmansk to haul extremely heavy nickel ore trains, but only a few were built. It is a shunter locomotive which in addition to the overhead catenary can also use its own battery packs as a power source to be able to move shortly on non-electrified tracks. VL in the locomotive name stands for "Vladimir Lenin", in the typical communist Russian way of mixing political propaganda into everything. 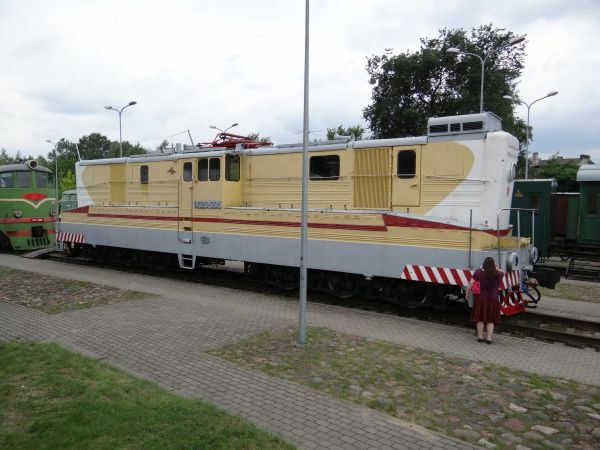 This was built at the Dnjepropetrovsk factory in Ukraine in 1967 and was used in Riga until 1995. Picture at railway museum in Riga 14.6.2013 by Ilkka Siissalo. Another view of the VL-26 no. 005 switcher. It is not exactly a "small toy". Here again Sanna Siissalo with her 1,7 meter height is asked to give a scale to the picture. Picture at railway museum in Riga 14.6.2013 by Ilkka Siissalo. This is what the suburban trains around Riga used to look like still a short while ago. It says "ER2", but actually this drivers' cab coach is of the type that was developed for the predecessor ER1. Nevertheless, these were still used with ER2 trains around Riga just about 10 years ago or so and the last similar drivers' cab coach left Estonian Tallinn only in 2015. These are the paintings that the trains had at Soviet times. These coaches were built by RVR in Riga in the beginning of the 1960s. 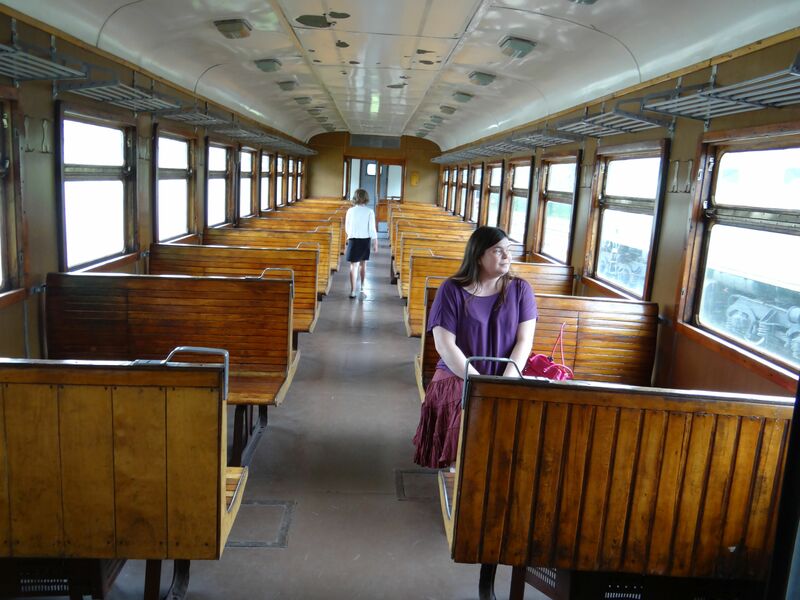 Picture at railway museum in Riga 14.6.2013 by Ilkka Siissalo. The ER2 trains are not exactly of a low-floor type. Train photographer Sanna Siissalo climbing onboard. Picture at railway museum in Riga 14.6.2013 by Ilkka Siissalo. Sanna Siissalo trying out the comfort of a typical Soviet era suburban train in an ER2 coach. Picture at railway museum in Riga 14.6.2013 by Ilkka Siissalo. 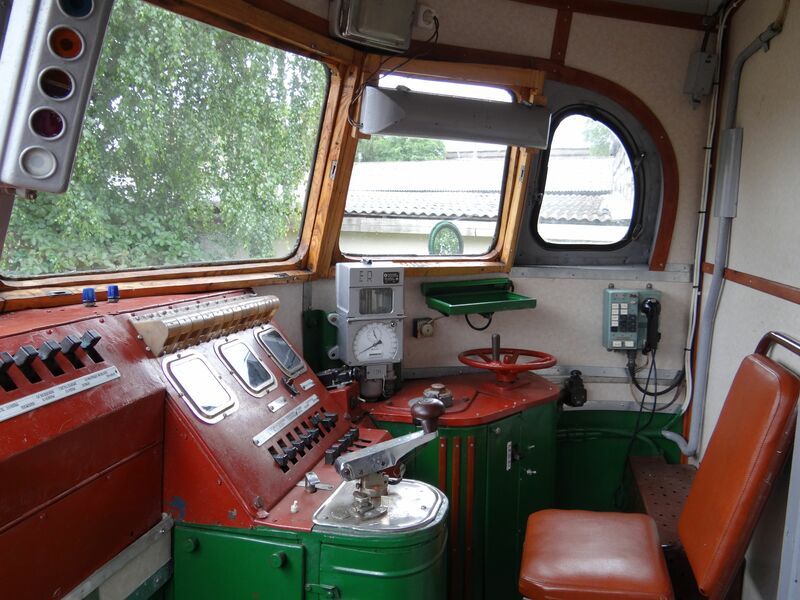 The drivers' seat of an ER1/ER2 suburban EMU train steering cab car. Picture at railway museum in Riga 14.6.2013 by Ilkka Siissalo. 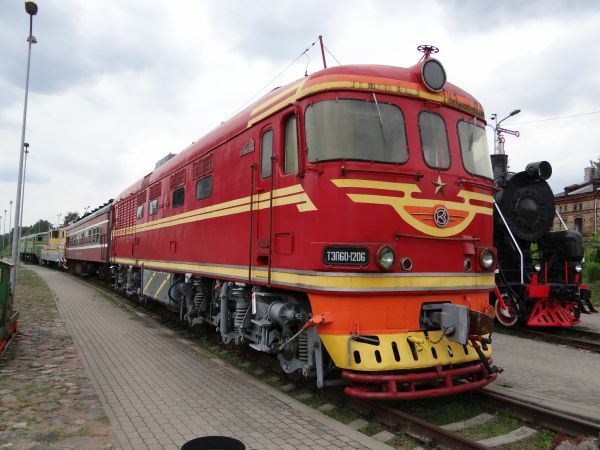 Soviet double locomotive of the class TE-3. Compare with the (a bit) more modern 2TE10 and 2TE116 shown in the category Latvia -> cargo trains. 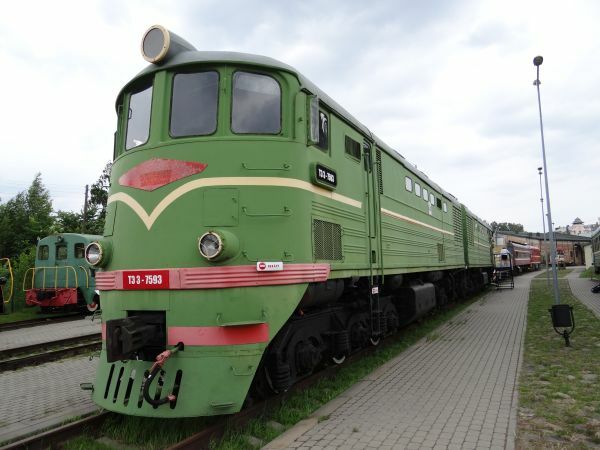 This type was built 1956-1973 by Kolomna factories in Moscow oblast and it was the first generation of diesels on the Baltic railways, setting aside steam engines in heavy cargo traffic. Its power rating was 2940 kW. Over 6800 locomotive pairs were built in Kolomna and Ukraine. Picture at railway museum in Riga 14.6.2013 by Ilkka Siissalo. 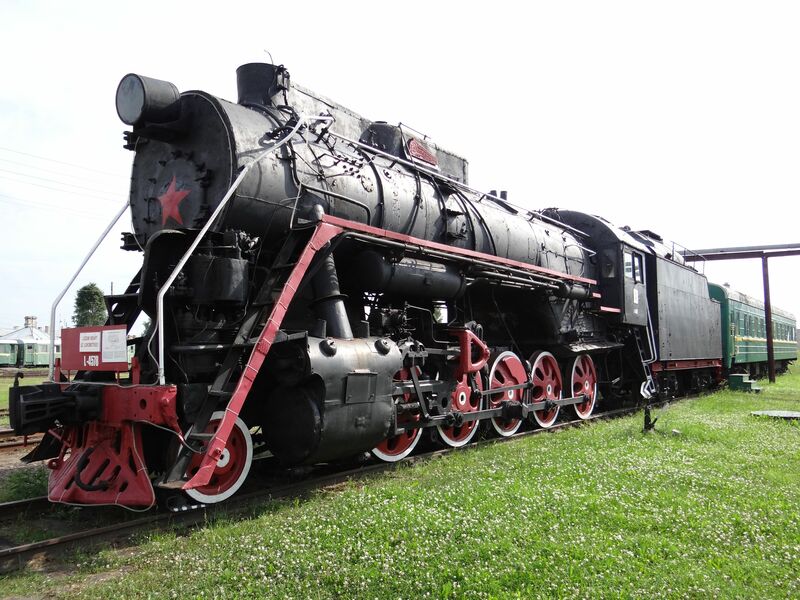 Another view of the massive TE-3 locomotive. Picture at railway museum in Riga 14.6.2013 by Ilkka Siissalo. Frontal view of the massive TE-3 locomotive. Note only one windscreen wiper. Picture at railway museum in Riga 14.6.2013 by Ilkka Siissalo. This kind of snowploughs used to be common in all northern parts of the Soviet union. Picture at railway museum in Riga 14.6.2013 by Ilkka Siissalo. Class TGK2 light shunter. 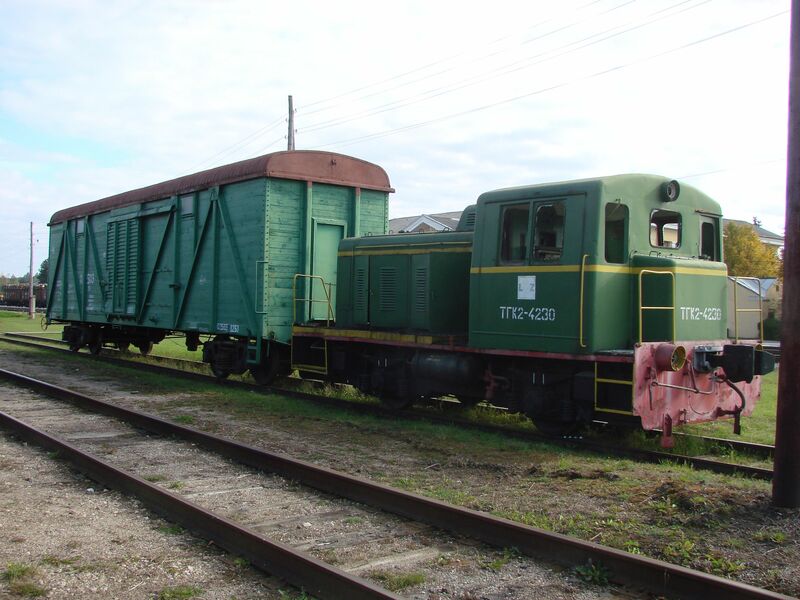 This was built 1981 at Kaluga machine factory in Russia and was used at Jelgava shunting yard. Picture at railway museum in Riga 14.6.2013 by Ilkka Siissalo. 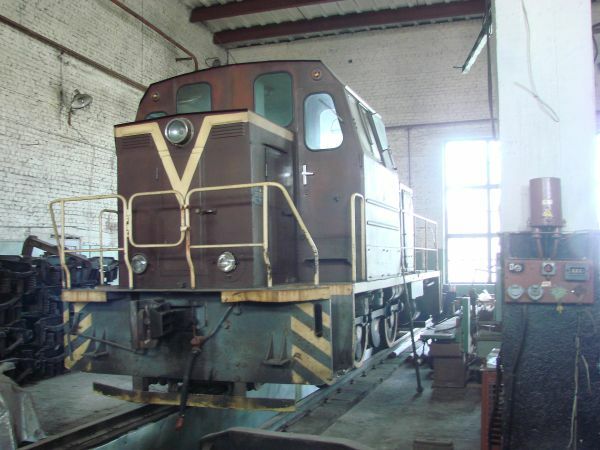 A class TGM1 shunter. This one was built in 1960 in Russia at F.Dzerzinskij factory in Murom and it has a hydraulic transmission system built by Voith of West Germany. These were built from 1956 to 1973. It is a close relative of the West German V60 shunter now known as German Baureihe 360 to 365. 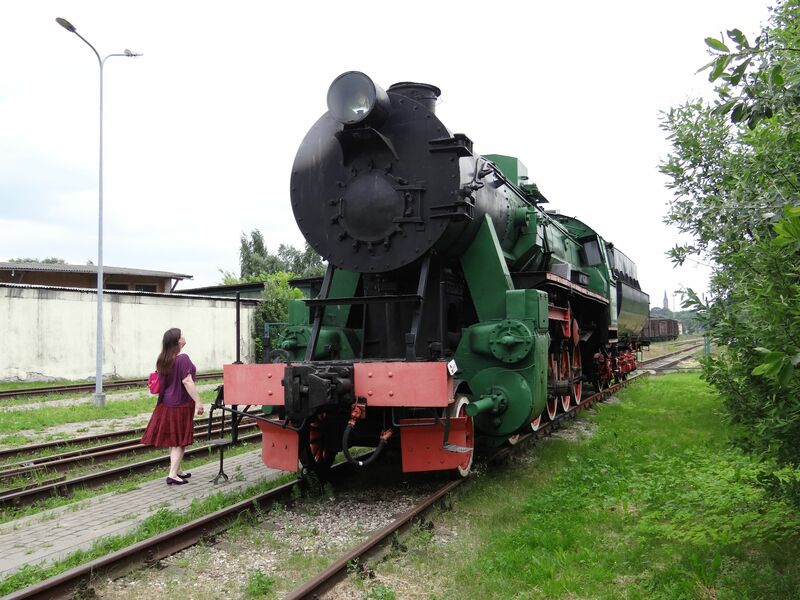 Picture at railway museum in Riga 14.6.2013 by Ilkka Siissalo. 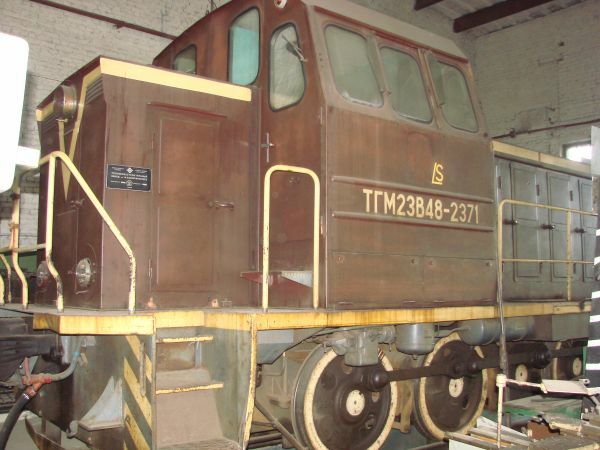 A class TGM3 shunter. This was a dieselhydraulic machine built by the Voroshilovgrad factories, now Luhansk, eastern Ukraine, from 1959 to 1967. The type was also licensed to be built in Poland by the company Fablok as the Polish class SM-15, but they soon got a bad reputation as underpowered and extremely unreliable machines. 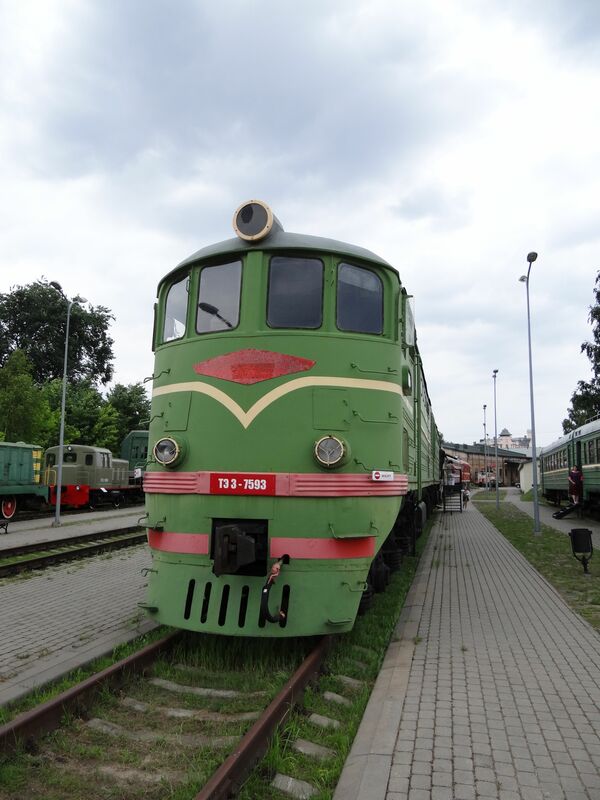 Picture at railway museum in Riga 14.6.2013 by Ilkka Siissalo. 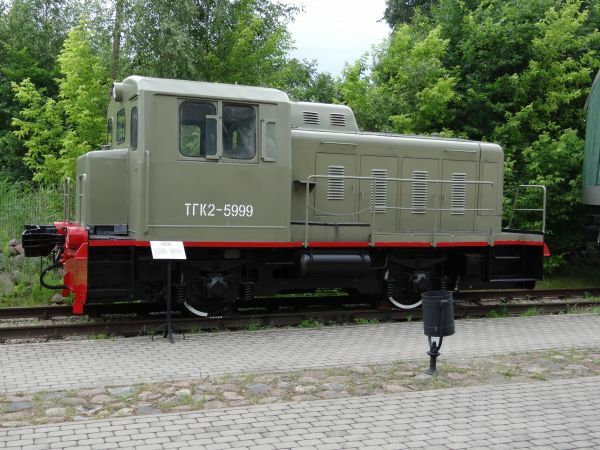 A class TEM-2 heavy shunter. The TEM-2 and the later TEM-3 were and still are extremely common throughout ex-Soviet Union. Almost 10 000 TEM-2 machines were built with two distinct body types and several subtypes. Currently many of there are being modernised and will still have a long life awaiting. 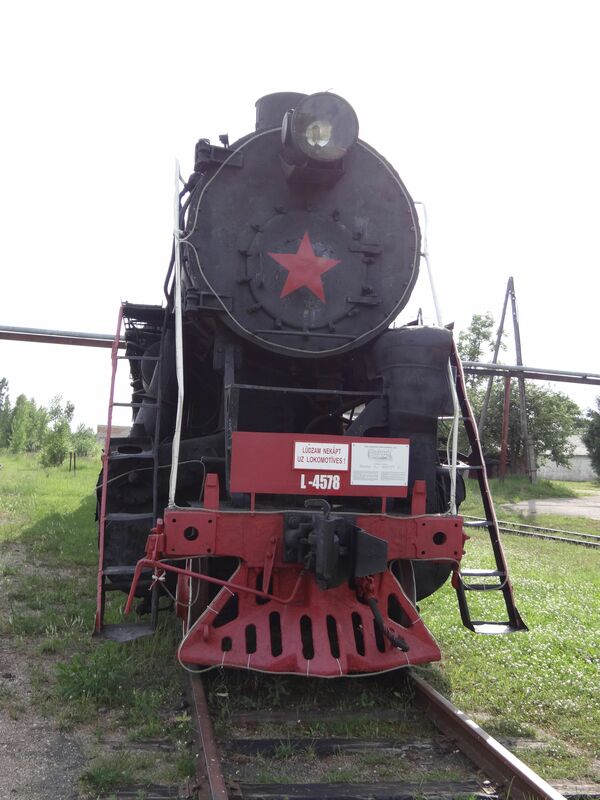 It is a Soviet Russian copy of the US ALCO RSD locomotive. This one was built in 1971. Picture at railway museum in Riga 14.6.2013 by Ilkka Siissalo. Class TEM-2 seen from the other side. 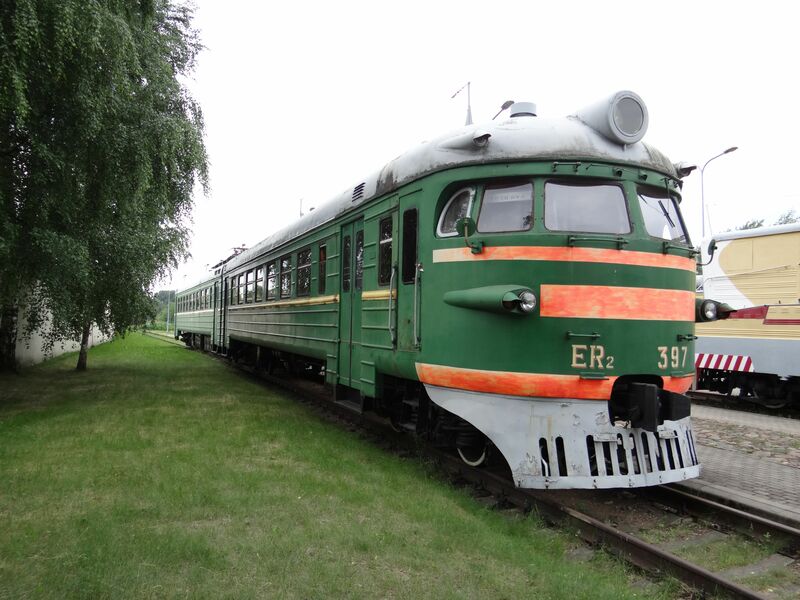 Picture at railway museum in Riga 14.6.2013 by Ilkka Siissalo. Train photographer Sanna Siissalo studying a Nazi German war locomotive of the class Baureihe 52, the famous Kriegslok. This one was built by Henschel in Kassel in 1942. It has later received a new kettle by the Russians, who regauged it for broad gauge and called it class TE. Picture at railway museum in Riga 14.6.2013 by Ilkka Siissalo. The Kriegslok Br 52 is not a small machine. Note the famous "Wannentender" (bath tub tender) coal wagon. This one was in active use in Latvia until 1990. 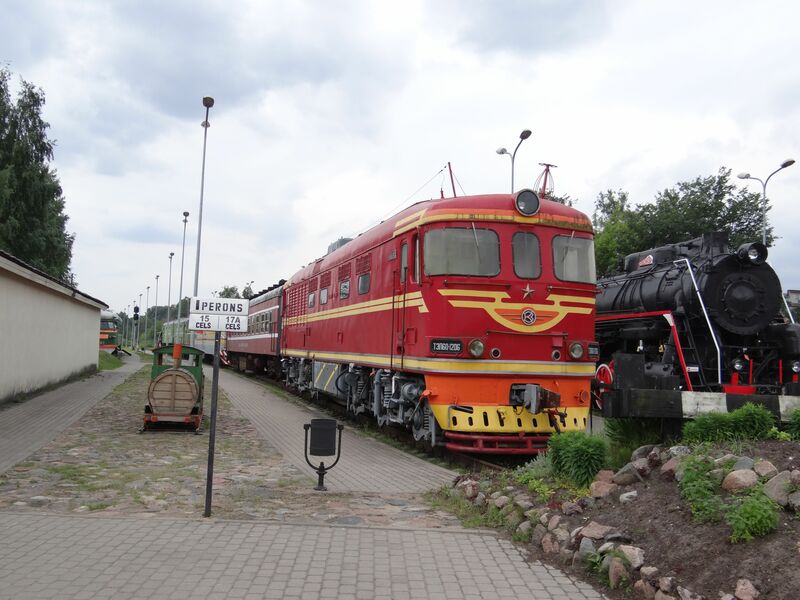 Picture at railway museum in Riga 14.6.2013 by Ilkka Siissalo. A class M2K-15 lightweight shunter built in 1950 in Russia at Kaluga machine factory. 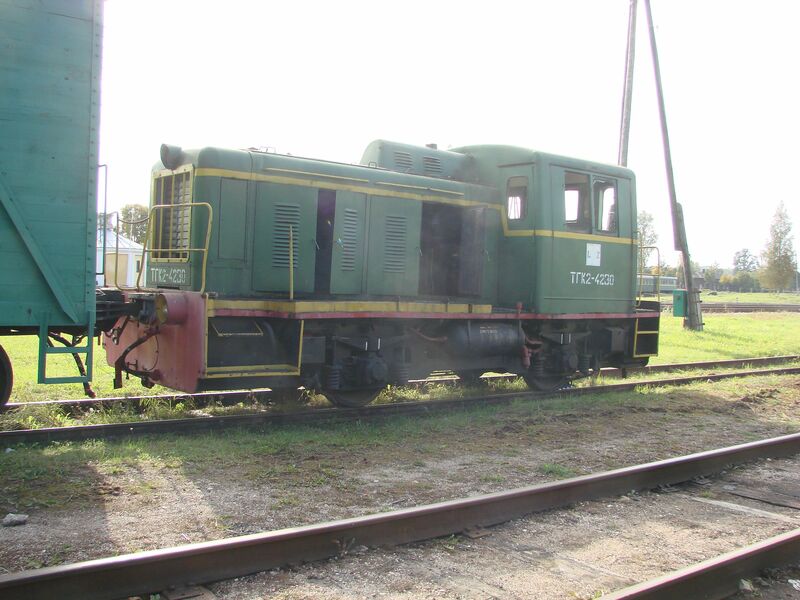 This model was built 1947-59 and it was used at industrial shunting yards. It weighed 15 tons and had a top speed of 65 km/h. Picture at railway museum in Riga 14.6.2013 by Ilkka Siissalo. 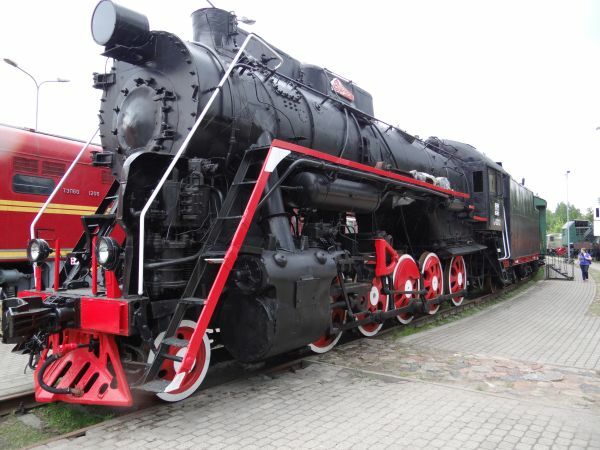 The class L was not the largest steam engine in the old USSR, but it was the biggest steam engine of the Baltic railways. They were built at the Kolomna, Voroshilovgrad (Luhansk) and Bryansk factories 1945-1955 in 4199 copies. Several of these have been kept as historic monuments e.g. in Tallinn, Vilnius, Riga, Gulbene and other locations of the former Baltic railways. 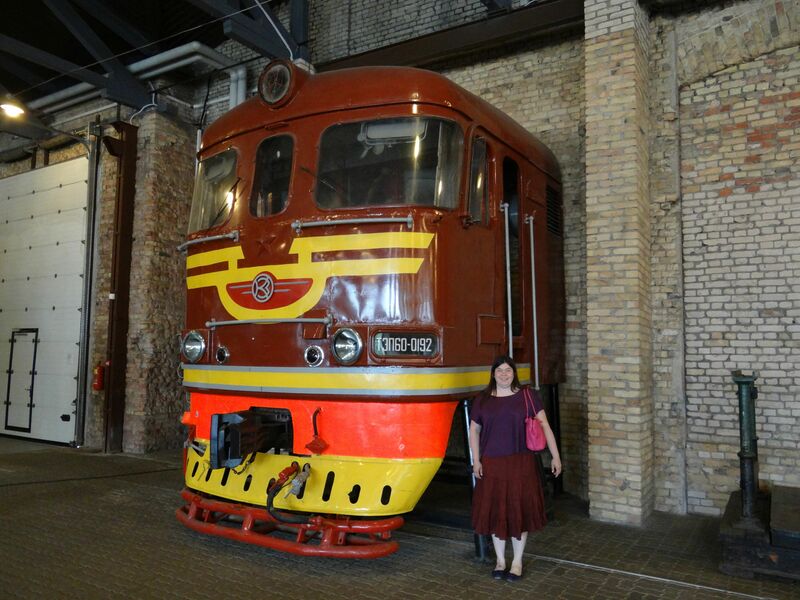 Picture at railway museum in Riga 14.6.2013 by Ilkka Siissalo. 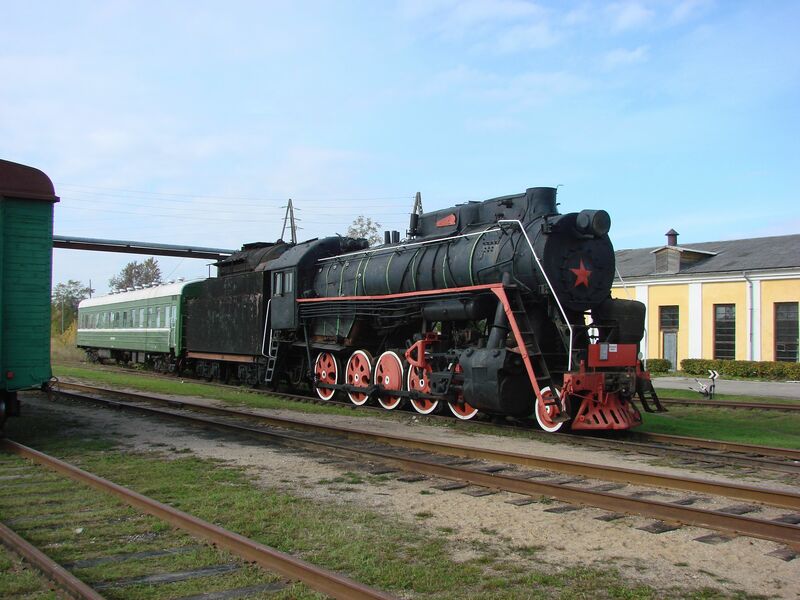 A Soviet time class L steam locomotive with one Soviet time express train coach at the the railway museum in Gulbene. 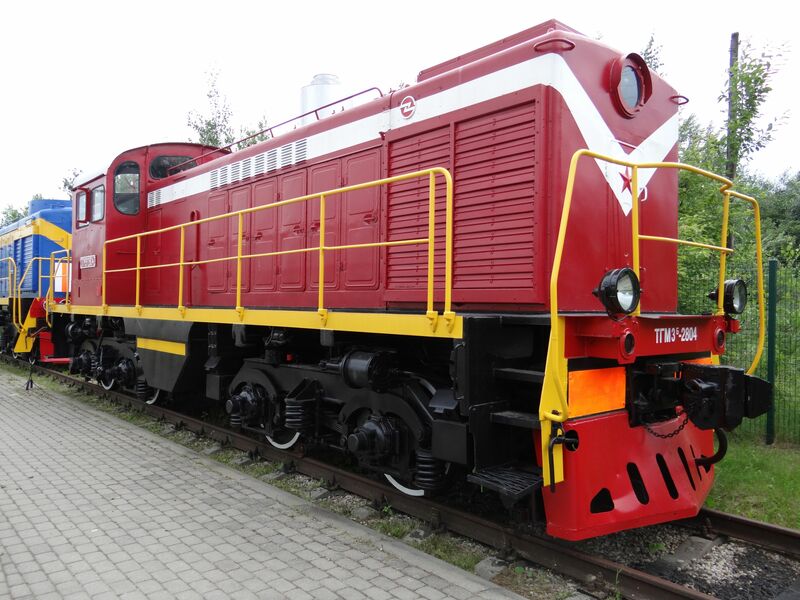 This one class L engine was built in Luhansk, Ukraine, earlier called Voroshilovgrad. Class L machines were built also in factories in Kolomna and Bryansk. Its top speed was 90 km/h and power rating 1648 kW. The machine weighs 170 tons. This one was equipped for burning oil instead of coal. Class L machines were in use in Latvia 1962 to 1988. Picture in Gulbene 26.6.2013 by Ilkka Siissalo. Frontal view of the same class L machine. Although this picture was taken in June, Christmas decorations had not yet been removed from the locomotive. Picture in Gulbene 26.6.2013 by Ilkka Siissalo. Side view of the same class L machine. Picture in Gulbene 26.6.2013 by Ilkka Siissalo. 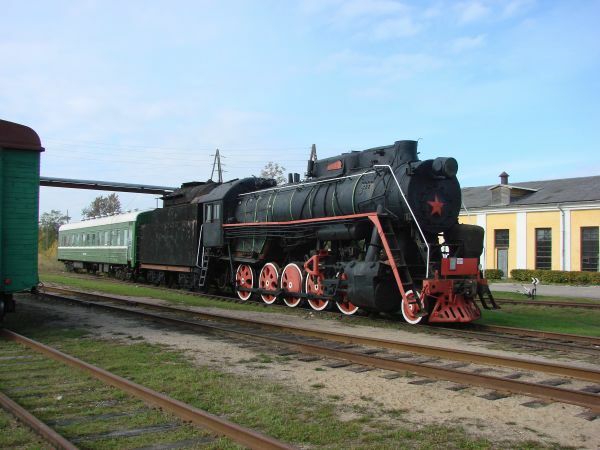 Still the same class L machine in Gulbene, but here in an older picture from 2008. Picture in Gulbene 25.9.2008 by Ilkka Siissalo. A TGK2 switcher engine partly destroyed by vandals by the Gulbene railways museum. Picture in Gulbene 25.9.2008 by Ilkka Siissalo. The same TGK2 switcher engine as above. Picture in Gulbene 25.9.2008 by Ilkka Siissalo. A class TGM23B48 diesel. These were used especially as industrial switcher engines and in harbours. Its nickname was "The bullfinch". Picture in Gulbene 25.9.2008 by Ilkka Siissalo. Another picture of the same TGM23B48 "The bullfinch". Picture in Gulbene 25.9.2008 by Ilkka Siissalo.